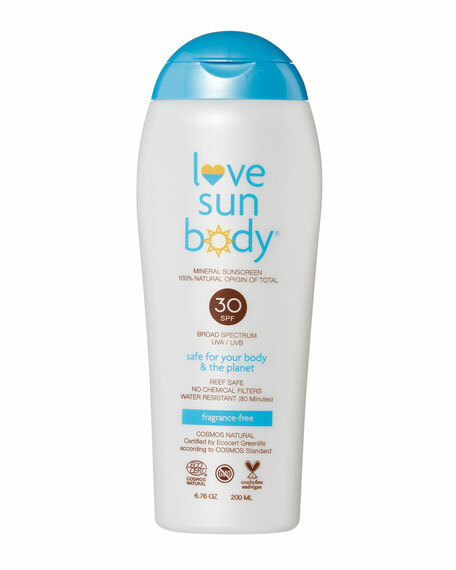 Love Sun Body 100% Natural Origin Mineral Sunscreens are the world's safest and highest quality sunscreens that meet the regulatory requirements of the FDA OTC Monograph System, the European Commission's recommendation on UVA protection and the highly regarded Cosmos-standard. SPF 30 fragrance-free, sheer lotion absorbs quickly, moisturizing matte finish, quick dry time, hypoallergenic, noncomedogenic. Broad Spectrum, Water Resistance (80 minutes). For full protection, apply liberally to all exposed skin 15 minutes before sun exposure, then rub in to reduce whitening effect. Reapply After 80 minutes of swimming or sweating. After towel drying. At least every 2 hours Sun Protection Measures. Spending time in the sun increases your risk of skin cancer and early aging. To decrease this risk, regularly use a sunscreen with a Broad Spectrum SPF value of 15 or higher and other sun protection measures including: limit time in the sun, especially from 10am to 2pm. Wear long-sleeved shirts, pants, hats and sunglasses. GMO, parabens, phenoxyethanol, nanoparticles, silicon, PEG, synthetic perfumes and dyes, animal-derived ingredients, petroleum, paba-free, hexane, gluten, phthalates, silicones, sulfates and ureas. These uniquely formulated, environmentally conscious sunscreens are made of natural-origin ingredients that are safe, effective, blend evenly, and are lightly scented. Cruelty-free and vegan.